December 12, 2018. Compilation of video interviews from the London premiere of "Mary Poppins Returns". July 16, 2018. 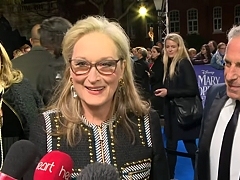 Compilation of reports and footage from the premiere of "Mamma Mia: Here We Go Again" in London. January 12, 2018. B-Roll footage from the French premiere for "The Post" in Paris, attended by Meryl Streep, Tom Hanks and Steven Spielberg. August 09, 2016. Meryl Streep is interviewed at the New York premiere of "Florence Foster Jenkins". August 03, 2015. Interview with Meryl Streep and Mamie Gummer at the New York premiere of "Ricki and the Flash". March 04, 2015. Report on the Tokyo premiere for "Into the Woods", including an interview with Meryl Streep. February 14, 2014. John Wells and Meryl Streep attend the French premiere for "August: Osage County" in Paris. January 04, 2012. Compilation of news reports on the London premiere of "The Iron Lady", featuring interviews with Meryl Streep.